Champagne Wishes and RV Dreams: There's rain...and then there's TO MUCH RAIN! We all have to put up with rain sometime...Traveling south along the Oregon coastline in December, one knows your just going to run into rain and fog sometime, it's inevitable. Better that, than ice and snow we figure! Last year, traveling south to California at this time, we took Highway 5 and did battle areas of ice and a little snow, so this year we decided that the coast would be a bit warmer, and a whole lot more scenic, to say the least. We started out in Portland, and headed south, with our first stop in Cannon Beach. From the time we left Washington, it began to rain. On and off, on and off. But, the temperature crept up bit by bit as we headed south, so, we figured, that was an okay trade off. 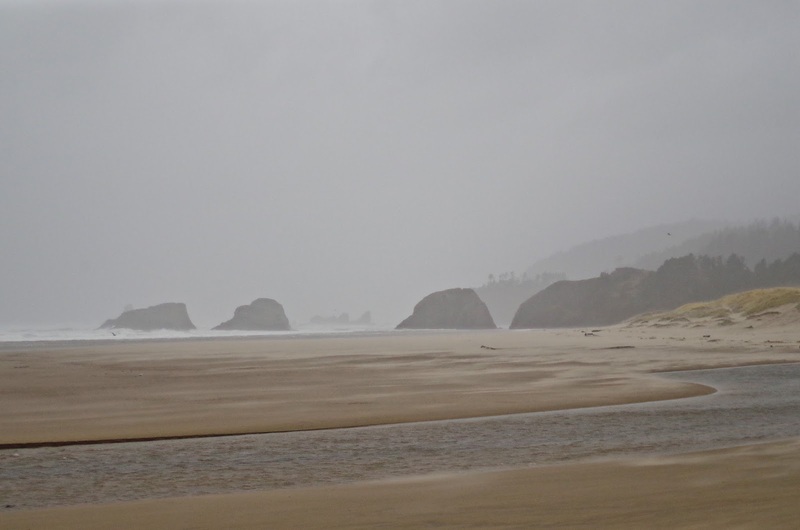 When we reached Cannon Beach, we decided to "hunker down" for a few days and see if the rain would lighten up enough for us to get out and see the area a little. There were times when it would pour down so hard, you could hardly hear each other talk, then there were times it would stop for awhile...those times we dashed outside and went for it! 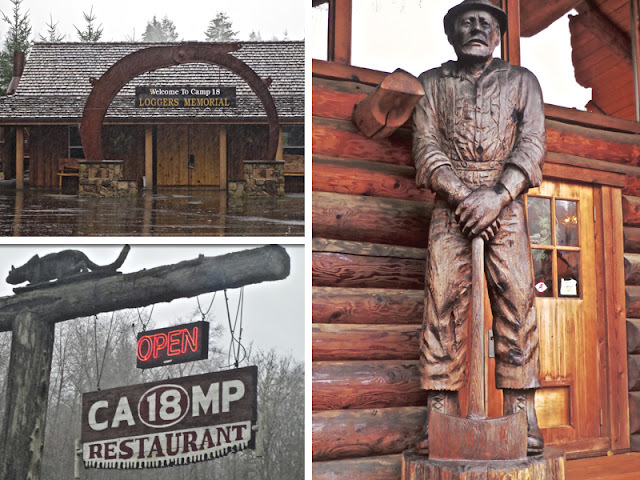 The following day, rain and all, we decided to venture out Hwy 26 and go see the Camp 18 Logging Museum. It turned out to all be "outside" (not "inside" as we had hoped) so, we drove around it and looked around as much as we could. The Loggers Memorial was closed, so we couldn't go in. Their very large, and quit beautiful restaurant was open, but it was a bit early for us to eat, so we just looked around a bit, and I took a few pictures of their incredibly large chainsaw statues out front. In spite of the rain, it was a fun stop. 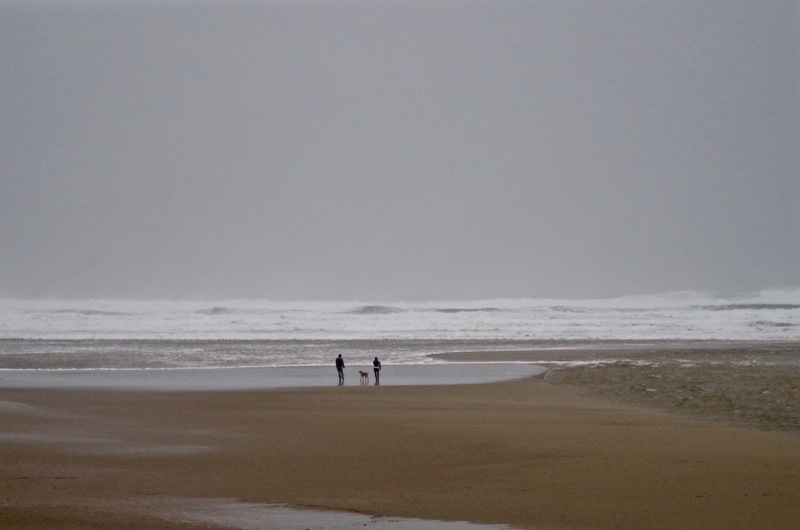 There's rain...and then there's TO MUCH RAIN...as we found when we finally left Cannon Beach after our three day stay there when we headed south. 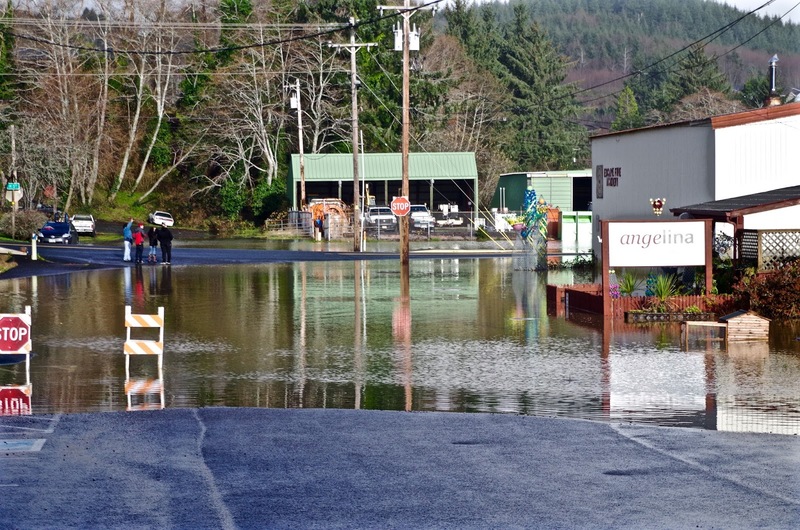 We got about 45 minutes out from our campground on Hwy 101 and bang, stopped dead in our tracks - because the road was FLOODED OUT! Not good. Jack pulled over and went and talked with the Highway Patrolmen to ask them about which way we could go to get back to where we wanted to be, which was Florence Oregon. They basically told him he couldn't. 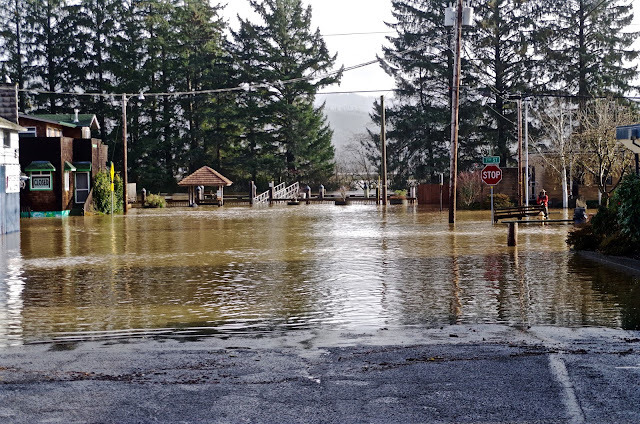 The highway was flooded from here to Tillamook and parts were even caved in. 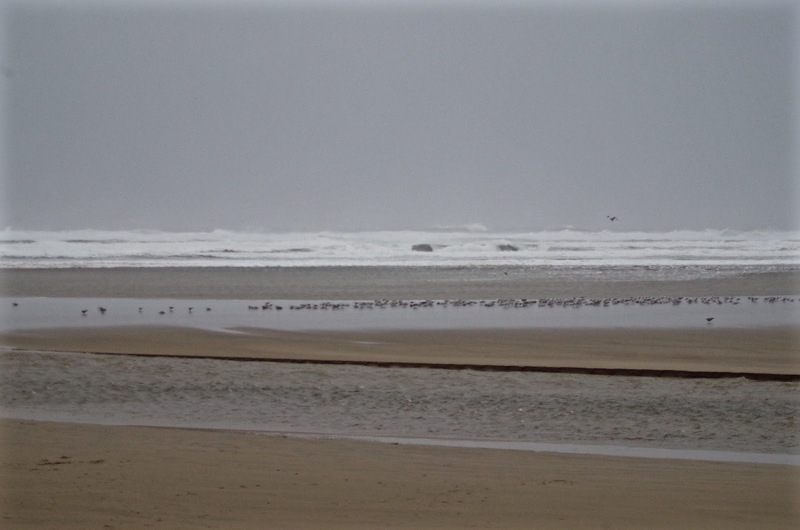 We needed to go all the way back north, the way we came, back by Portland to Eugene. Bummer. 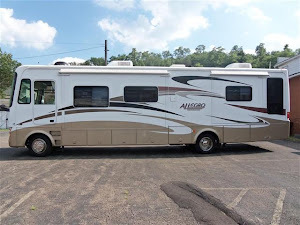 There went our three-day reservation in Florence. I made the call to cancel. So, back we went. Guess who made an appearance the rest of the day? The sun! Wouldn't you just know it! We made Eugene by 4:00 and called it a day. 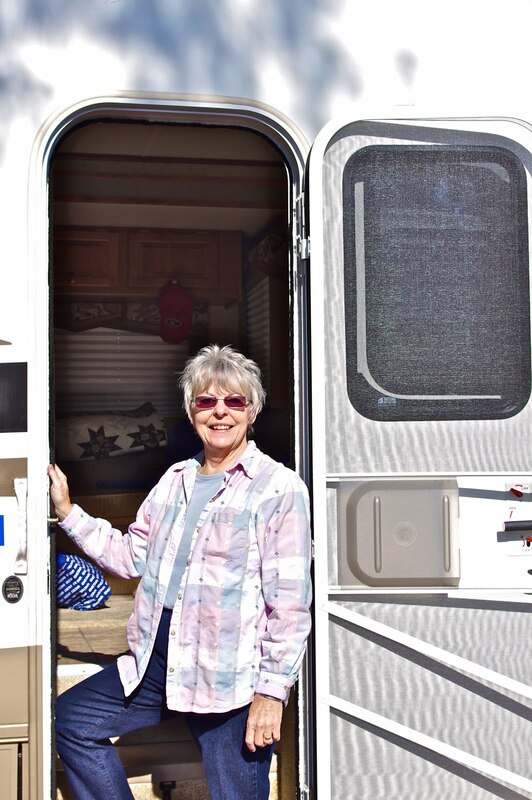 One thing about traveling in an RV, the WEATHER is the one determining factor as to when and where we go, not us! Oh well, another adventure awaits us tomorrow!